Choosing the right chiropractor can be an intimidating journey, but we’re here to help make it a little bit easier. We won’t pretend we’re the only chiropractic clinic around. In fact, a quick google search for “East Stroudsburg Chiropractor” returns more than 25 businesses in the area (of which we’re one of the highest rated – not to toot our own horn). 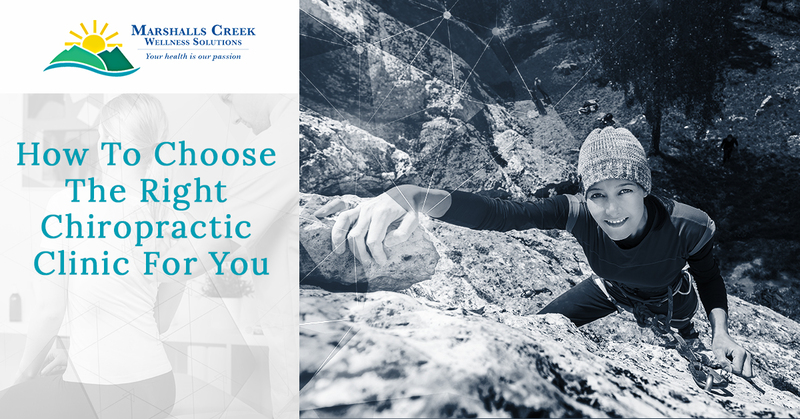 Here are a few things to take into consideration when choosing a chiropractor, and why Marshalls Creek Wellness Solutions is one of the better options. With a bevy of online reviews available for just about every business, it is easy to turn to the internet for customer experiences. Making sure that good things are being said about your chiropractor is a good place to start when choosing the right chiropractic clinic for you. Here are just a few things that our Marshall’s Creek patients are saying about us. You can see all of our excellent reviews here. “Marshalls Creek Chiropractic really cares about you. Everyone on staff there is so friendly and helpful there. Appointment times are easy to come by and the Doctors are very competent, caring, and efficient. I would recommend this office to anyone needing chiropractic care.” – Timothy B. “Kind, patient, compassionate and understanding staff. Walked me through my first appointment, told me exactly what to expect, and what my long term goals would be. Convenient location. Extended hours to suit any schedule. Family friendly. A+ from every angle.” Jennifer P.
“Thank you for your informative, professional and caring adjustments during my visits to Marshalls Creek Chiropractic. Your knowledge and support has helped my recovery and continued health. I am proud to say; “I love my chiropractor”.” – Julie H.
You can see that there are certain attributes that our patients associate with us. Words like caring, compassionate, patient, understanding, and informative show up throughout our reviews. We know that having a chiropractic adjustment can be scary – we are literally adjusting your bones. But having a staff that is patient, that explains every step, and that is up to date on best practices like we are can make a huge difference in your experience. At Marshalls Creek, we try to be as well-rounded as possible. We have Doctors Anne Marie and Brett on hand who are experts in the chiropractic field. But as a wellness center, we do more than just chiropractic adjustments. We also specialize in offering corrective exercises and physiotherapy to help go beyond just an adjustment. We also have a weight loss and nutrition program to help you live your healthiest lifestyle, and even offer Neurological Stress Reduction Therapy to help with allergies, asthma, IBS, and other symptoms. We believe that a healthy body starts from the inside out, and want to offer full-spectrum services to provide that. In the medical industry, there are years of training involved before doctors can receive their own patients, but a doctor who has been in the practice for a long time usually garners some extra experience points from patients. Both of our on-site doctors, Dr. Brett and Dr. Anne Marie have been licensed chiropractors since 1989. Dr. Anne Marie has two post-doctoral degrees specializing in the chiropractic care and wellness of pregnant mothers, and children ranging from newborns to teens. Both doctors have a post-doctoral degree in Chiropractic Orthopedics. Along with the two doctors, our Marshalls Creek clinic has nine assistants that are dedicated to your health and wellness. Paying for medical services can be a burden for many people. At Marshalls Creek Wellness Center, we accept most major insurance plans, as well as auto accident, workers compensation, personal injury, and Medicare. Understanding chiropractic insurance coverage can be confusing, so feel free to give us a call and we’ll be able to verify your benefits with your insurance agency at no charge to you. If you do not have insurance, we offer flexible payment plans. We never want our patients to not get the help they need because they don’t have insurance. We will always be upfront about the costs of our services, and we encourage you to contact us about payment options. If you are in East Stroudsburg, stop by our chiropractic office or schedule an appointment today. We would love to prove to you that we truly are the best of the best when it comes to your health and wellness.